Associated Press Aquaculturist and entrepreneur Tollef Olsen inspects kelp growing in a beaker at a lab at the University of New England in Biddeford, Maine. The school’s Macroalgae Nursery and Research Cluster rears sugar kelp. BIDDEFORD, Maine – It’s green, it’s gooey and it’s giving Maine’s famous lobsters a run for their money. Well, not really. At least not yet. But when it comes to seaweed production, Maine is the country’s No. 1. The state now supports more than 20 companies that grow or collect seaweed, about double from 10 years ago. Maine harvesters collected 17.7 million pounds of seaweed in 2014 – the most ever recorded for the state and more than four times the 2004 total. "Maine is excited about seaweed, and the world is excited about seaweed," said Hillary Krapf, founder of the Maine Seaweed Festival, whose second year drew more than 3,000 people in August in South Portland, more than twice the first year. "It’s totally piqued right now." It’s true. Seaweed is hot. "More people are interested in sea vegetables, and a lot more Americans are a lot more savvy about eating nutritious foods," said Susan Brawley, a University of Maine botanist. "There’s no one profile a seaweed has, just like a tomato is not like a spinach." Seaweed – formed from marine algae – comes in many forms. Rockweed is by the far the most commonly harvested type in Maine, and its uses include fertilizer, soil conditioner, nutrients for animal feed and extracts by commercial food processors. But seaweed harvesters and processors here said there is also more interest in at least nine other kinds of seaweed as food, and they tout the plant’s high concentration of nutrients. Popular Maine seaweeds include sugar kelp, which can be used as an alternative to pasta, and Irish moss, which is used in brewing beer. Seaweed production in Maine is just a blip on the worldwide scene, an annual 25 million-ton business that is dominated by China, Indonesia, the Philippines, South Korea and Japan, according to the Food and Agriculture Organization of the United Nations. Maine overtook California as the biggest producer of seaweed in the U.S. in 2006, state and federal figures show. Harvesters here said they have leveraged Maine’s marine heritage and the boom in natural foods to grow interest in the state’s seaweed. 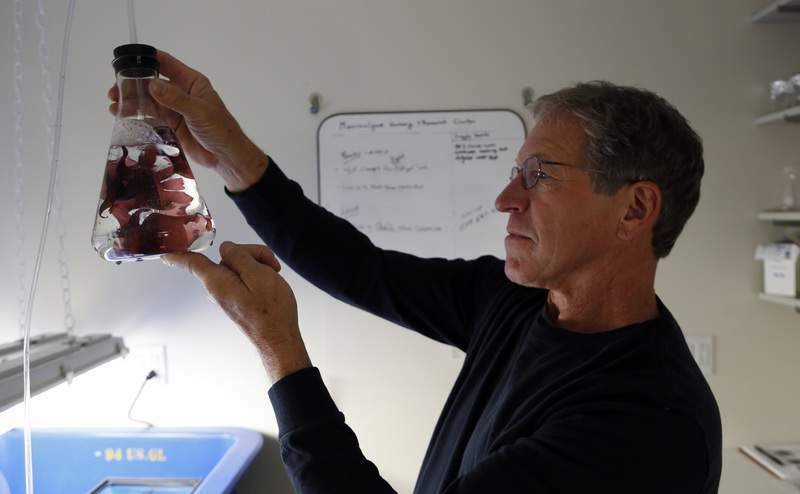 Michael Lomas, who heads a national marine research lab in East Boothbay, Maine, said the growth has raised Maine’s national stature as a major seaweed producer. Small businesses that make a living on seaweed products report more interest in their goods. It’s good news for seaweed industry veterans such as Shep Erhart, founder of Maine Coast Sea Vegetables, which sells things from seaweed cookbooks to Applewood-smoked seaweed. He and his wife have been trading in seaweed for more than 40 years. Many seaweed products are popular because of their artisanal production, he said: "It’s really a hand-crafted food." Some environmentalists register concern about the growth, arguing that stripping rockweed from tidal areas damages coastal ecosystems. That’s one reason growth in seaweed aquaculture, as opposed to wild harvesting, is important to sustain the industry, said Tollef Olson, a South Portland seaweed farmer. He claims to have opened the state’s first seaweed farm, on Casco Bay in 2009. "It gives us a lot of control over the raw materials," Olson said, noting at least seven other seaweed aquaculture companies do business in Maine today.